If you are developing a form and you require certain validations; check if username is available or not for example - the way to do that is to listen for the change/focusout DOM events. You can also check it on every keypress but if the validation does some expensive checking in the background that is out of the question. So here is a really small jQuery plugin that does tell you when a user finished typing inside a text box. The way it does it is to compute the speed the user is typing with and when a delay longer than twice the speed average occurs, the event is triggered and your validation function is called. Simple enough. Our Transylvania Flex Group 3th event will be held this Saturday (November 21, 2009) in Cluj-Napoca. This one will be a showdown between RIA technologies, with advocates from our Betfair Office. 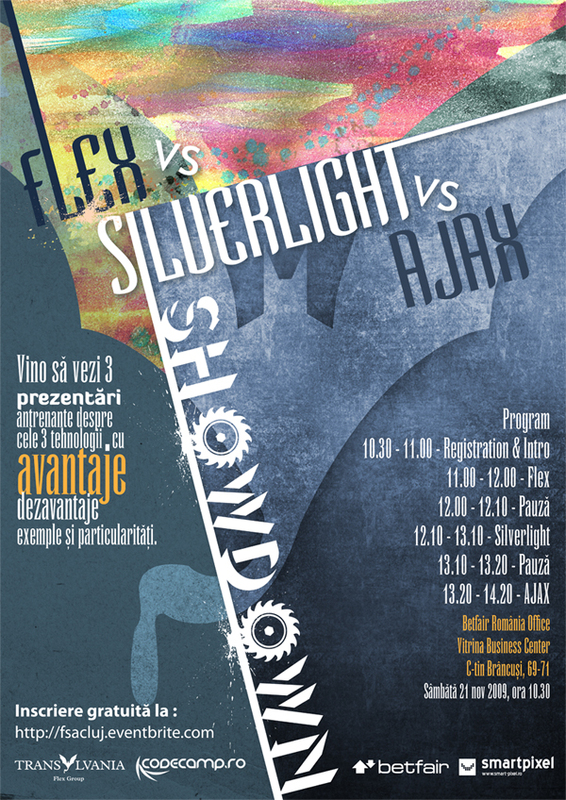 Iosif George for Flex, Vlad Nemes for AJAX and Silviu Niculita from RIASolutionsGroup for Silvelight. Registration is free and you can signup for the event here. See you there !